To be able to drive your boat, feel the wind in your face and listen to high quality sound is possibly one of the most liberating feelings. We’ve taken a look at some of the best marine speakers on the market - and here are the results. We've rated our products according to affordability, audio quality, and durability. For the most part, we haven’t ordered these reviews due to the fact that it mainly comes down to your own preference - just like with the size of a wakeboard, it's all about what fits the individual. We've put together a range of products that will fit all budgets and use cases. Read our in-depth reviews or simply explore the products in our scrollable table below. Do I Need to Buy an Amplifier? What About a Digital Media Receiver? How Many Speakers Can I Connect to the Stereo Unit? What's the Difference Between Marine Speakers and Wake Tower Speakers? ​Should I buy 'waterproof' or 'Water Resistant' speakers? What Does 'Injection Molded Polypropylene Cone' Mean? Should I Get a Subwoofer? One of the best marine speakers available right now is the Polk Audio MM651UM. It’s at the higher end when it comes to cost, however definitely doesn’t break the budget at around $134. Why do we think this is the best of the bunch? It packs a punch and delivers a high-quality audio experience. You can really ramp up the power with this while maintaining quality at all volume levels. The MM651UM has been 'Klippel Optimized' from top to bottom (i.e. all components), meaning you'll get incredible audio quality. Polk Audio has the reputation for units that can take a beating from the weather and this one is no different. Its stainless steel input terminals and mounting hardware ensures that corrosion or tarnishing are problems you don't have to worry about. This excellent marine speaker has also been well-built and sealed so that water cannot sneak inside. It has also passed tough tests, withstanding 600 hours of UV and salt fog testing. So whether you're going out in the rain or shine, you won't have anything to worry about. Overall, the MM651 is amongst the most durable options out there. It has the highly-coveted ASTM certification as well, ensuring third-party verification of all durability claims from the manufacturer. This means that everything they list on their sales copy isn't just lip service. The grille includes a tweeter mount which means that you don’t need the traditional tweeter mount for it. The speaker is conveniently easy to install on your boat and doesn’t require much depth meaning it can be positioned in more places. Its cutout diameter (measuring in at 5.06 inches) is ideal for the standard 6.5" speakers you'll find in most factory installations. Overall, this is probably our favorite marine speaker. Its loud, durable, and the sound quality is absolutely excellent. Considering you end up paying just a little bit more for this unit compared to other entry-level models, we say it's worth the expense. ​And many others agree with us: reviewers and consumers alike rave about this unit from Polk Audio. We also have to add an extra bit of praise for the company's support team. Polk is unique compared to other manufacturers in that it only builds audio units (as opposed to just 'general electronics). This translates to an excellent support team, thorough manuals, and an ever-growing online FAQ and how-to section. The company also has an avid following from enthusiasts, which means the forums are always lively with discussion and help from fellow consumers. From another brand which is known for producing high quality speakers, the Kicker KM654LCW is a top marine grade speaker. At 6.5 inches in diameter, this speaker is designed to best fit into panels. If you purchase this speaker, you can be confident that it will last for the conditions you’ll need it. It’s waterproof and resistant to salt and UV damage, which means that you can happily leave them in your boat all the time. Its built with lightweight marine grade polymer, ensuring excellent quality across the board. Specifically built to marine grade, the leads are protected from moisture and the speakers have been extensively tested for handling prolonged exposure to UV and salt. This is exactly what you'd expect and want from a solid set of marine-grade speakers. The peak power of this speaker is 195 watts and a sensitivity rating of 90B, which means that it is perfectly capable of delivering impressive sound quality. The speaker also performs incredibly well in the low frequency range, offering good bass. The speakers weight 6.7 pounds for a set of two, which means that they’ll be ok for moving around. As well as being built to impress in terms of durability and audio quality, this Kicker set comes with removable colored LED lights. As you would expect from a top-of-the-range brand, these are resistant to UV and salt damage. As well as performing well, the main selling point of these speakers is the low price. For good boat speakers, these are right at the low end of the price bracket, so if you’re on a budget then choose these. The power is somewhat limited, with a max power rating of 150W but that is to be expected at this price range. This means that the noise won’t go much past the length of the boat. They are really supposed to be powered with the head unit, but if you want them louder, then you’ll need to supply a good bit more power. The design of the speakers is fairly neutral, coming in either black or white, which is great for blending into most boat designs. Looking at them, you wouldn’t be able to tell that they are cheap marine speakers. An excellent aspect of these speakers is the ease of installation as it doesn’t need any calibration. All you need to do in order to get it set up is to plug it in and you’ll be ready to go. If the cut-out for the speaker is too small, then it comes with an adapter to fit. Unfortunately, the warrant is only for one year which is on the short side, however it will cover you if they are faulty in the first instance. For budget speakers, these are a top pair for good, steady sound quality and the convenience of installing them. They’re an ideal pick for those who just getting into marine audio. For another pair of top quality marine speakers which won’t break the bank, it's worth looking at the Pioneer TS-MR1640. At a 30W nominal rating, at first glance these speakers don’t appear powerful. However, a sensitivity rating of 91db/W/m means that you won't be needing much power from your head unit. Although you won’t produce huge sound with this set, at a peak power of 160 Watts, they’ll be able to handle loud parts of songs easily and will produce balanced sound. Furthermore, the high power rating adds to the long term durability of the speakers. In terms of how they will hold up in a damp atmosphere, it’s important to note that they are advertised as water resistant, rather than waterproof. This is a potential draw back to an otherwise great pair of boat speakers. That said, they’re still designed to handle a marine environment and will hold up well, but the sound may degrade over years of use. The speakers also has an excellent woofer system , featuring 6.5" waterproof polypropylene with rubber surround. You can expect fantastic lows on this unit, with full sounds that will cut through the waves and weather conditions. Considering this model's price point, we were pleasantly surprised by its audio performance. Mounting the speakers should be no bother at all due to their size. They’re also shallow (2.25in) which means that you can place them in smaller spots on the boat. Aesthetically, the speakers look good and should fit into any theme well given that they are white. They’ll blend in naturally to a white or cream boat and can work as contrasting colors in darker boats. It may not be the leading speaker on the market but it’s certainly a bargain buy and an excellent choice for entry level speakers. If you’re looking for a good alternative and want to push the budget, check out our next review below. Audiophile? This one may be right up your alley. For high power and what may be the best marine speaker out there, the JL Audio M650 is for those who are willing to stretch the budget and expect top quality. It is capable of handling a lot of power, with a 75W nominal rating a sensitivity rating of 89.5db/W/m. The peak power handling is 225W which means that you’ll really be able to hear the loud parts of songs well. With power ratings like this, the speaker is well suited to larger boats require loud sound. Given that it’s a higher spec speaker, the portability and ease of installation is obviously a bit trickier. If you’re new to mounting speakers on a boat, then you should spend a bit of time making sure that you get it set up right. The unit is deeper than most, sitting at 3 inches. Further, the driver will need to be connected to the crossovers and there are multiple screws to mount it. It won’t be a simple job of plug in and play like some of the other cheaper speakers. What you would expect from quality speakers at this price is high durability, full waterproofing and UV resistant. That’s exactly what you get here. These speakers have gone through some tough testing to ensure that they’ll hold up well over time. They’ve even been tested specifically to measure how well they’ll last with exposure to UV rays and salt fog. For who is this speaker a good choice? We’d say it leans towards those with more of a passion for marine audio and those who require/demand high quality, loud sound for their boat. The JL Audio is for the real speaker 'connoisseur'. At Sniff, we're huge fans of Rockford Fosgate. The company consistently churns out speakers that feature fantastic audio design, sturdy and durable build materials, a trusted manufacturer warranty, and simplistic design elements that work in most boats. And yes, you know what we're going to say next: the PM2652's are no different. The reviews are glowing, the audio and build quality impressive, and we're happy to say we give the product a solid thumbs up. These speakers are a little pricier than entry-level models, but there's are plenty of reasons that justify that. For example, these speakers offer True Marine Grade compliance, meaning you can trust that they'll perform to a minimum standard that many cheaper models simply won't match. The speakers themselves are what's known as 'Element Ready', which means they can handle UV, water, corrosion, and dust. 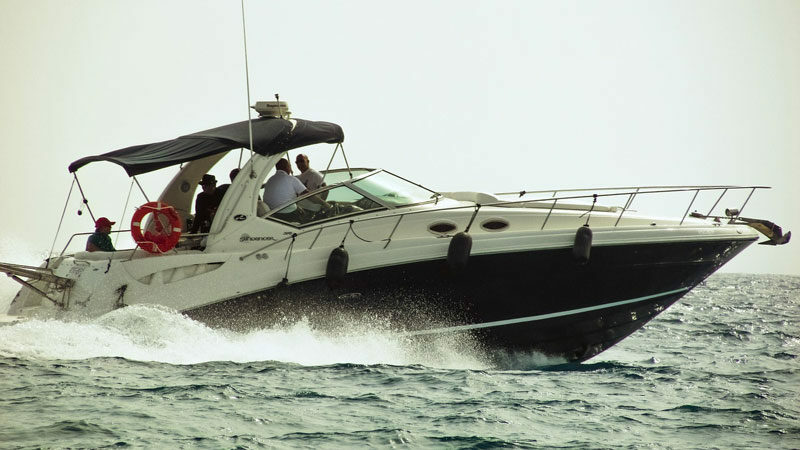 In short, you can take them out to sea without worrying that they'll break down after just a couple of trips. The mounting hardware is stainless steel rather than low-cost alternatives you find with cheaper models. There's more to the 'Marine Grade' rating than simply being long-lasting. The components and audio design elements ensure that you get superior sound when out on the water - many other models work fine when tested indoors or in stable low-grade weather conditions, but can't handle anything more than that. Rockford Fosgate has ensured you get that extra level of sound quality you're looking for. If the Infinity Reference is a little too expensive for you (we've actually not included it in this review series for this very reason), the Infinity Marine is a solid value choice. It's build is sturdy, UV and weather resistant, and the basket is corrosion-proof. What really impressed us with this model is the sound quality and loudness. Because it has a high sensitivity rating, you'll still get surprisingly loud volume out of a lower power pair of speakers. Not bad at all. Of course, you have to keep in mind that this model is a value option. In other words, it's not going to have everything you'll find with some of the other units we've reviewed above. For example, the audio quality is fantastic considering the unit's price, but it's not going to impress a proper audiophile. The bass is often overpowering, but not to the point of ruining the experience. The unit also doesn't have ASTM certification (which signifies its ability to handle salt, fog, etc.) and while the company purports that the Infinity Marine speakers are still durable, it's not guaranteed. Nevertheless, the entire unit is built of quality polypropylene - the tweeter, grille, frame, and woofer can be expected to last through challenging weather conditions. Considering third-party testing and certification adds another layer of costs to the manufacturer, it's understandable why some opt to forego an 'official' stamp of approval. What we do always bemoan when looking for a decent set of speakers is the lack of choice. As with most other manufacturers, both the Infinity Marine and Infinity Reference are only available in 6.5" versions - so if you're looking for another size, you're out of luck. Our verdict? No one is going to call them the best marine speakers on the market, but if you're looking for an entry-level set this is as good as it's going to get - and that's pretty good indeed. In terms of pure value, we say it beats the Infinity Reference. Compared to JL Audio's flagship M650 model, the MX series is essentially a lighter duty speaker from top to bottom. Just looking at the spec sheet gives it away, but you'll always just feel it when handling and looking at both of these side by side. Our recommendation is to look put your pennies together for the more expensive version, but the MX650 isn't a bad choice either - we explain in more detail in our review below. JL Audio puts a strong emphasis on marine certification, so just like with the M650 you can expect excellent durability here. Each and every component has been put through rigorous testing - you can have every expectation that these speakers will last you for the long-haul. What's a little disappointing with this product is the less-than-stellar audio performance. While it can certainly be described as being more than just okay, it's never going to win any awards. The power handling is also not anything worth writing home about. Having said that, the listening experience is certainly stable and consistent. Third-party tests report solid results at every frequency level, resulting in balanced audio output throughout. Overall, the MX650 is, despite its reputation as the M650's inferior little brother, a fantastic set of marine speakers in its own right. If you're into your car speakers, you may have already heard of the Polk DB+ series. Many consumers don't realize that this set is also fully marine certified, which means they're also a serviceable option for boat upgrades. What sets the Polk DB+ 652 apart from other models in this price point is the sensitive rating. Coming in at 92 dB, making it one of the more efficient models we've reviewed. In short, you're getting serious bang for your buck here - you'll get the volume you're looking for when out on the water. As we've already mentioned, this product can handle weather conditions when you're out in the water. Whether it's salt, sun, or water, this Polk product can handle the load. We've also been surprised by the audio quality you get for a product in this price range. While you can't expect top-of-the-line stuff, the quality you'll get is surprisingly good. Nevertheless, remember that you do get what you pay for: compared to more expensive speakers, the audio quality is not balanced throughout. Aesthetically, the Polk DB+ 652 shines. The product is slim and stylish - it just looks good. The installation process will leave the speakers fitting neatly into your boat's enclosures. Overall, you're getting look that's higher-end than what you're paying. We recommend this model to those of you who are a little light in the wallet are looking for an affordable alternative to the Polk MM (our favorite model!). Rounding off our series is the Wet Sounds XS 650. While these speakers don't offer the best audio quality around, the overall conclusion we've reached is that they're still a very solid purchase. As the name of the company suggests, Wet Sounds deal in marine speakers only. The company knows how to build specialized equipment that works out on the water, and the 650's reflect that from top to bottom. The audio you'll get from these speakers can be described as having pure power. ​With a continuous power handling of 100 RMS Watts, this Wet Sounds model stands near the top in this regard. In fact, you can easily use this set as part of your tower solution, as the volume can easily reach beyond your average in-boat installation. The speakers are also incredibly durable, which isn't a surprise considering the company's specialization in water equipment. You're getting a set built to last the damaging environments you'll find when out in your boat: titanium tweeter, polypropylene woofer, and the frame and grille used Nylas. In terms of audio quality, the XS 650 falls just a wee bit short. The midrange and bass performance, for example, has been rated as mediocre by several third-party testers. The sensitivity rating of 90 dB is also not market-leading. However, the audio is balanced, which means you'll still get a very good experience overall. This is one of the most important factors to take into consideration as a great speaker needs to be able to turn the power applied to it to sound. To get the best sound quality and marine stereo setup, you also need to make sure that your boat's receiver's power rating is the same as the power rating of the speakers you want. Under-powering your speakers means that you will get sound distortion and a weak performance, and can even damage your speakers. You might notice that a lot of manufacturers brag about the peak power handle, but this is just marketing mumbo-jumbo. What you want to pay close attention to is 'Root Mean Square', which means the amount of power a set of speakers is able to handle in a continuous basis. The sensitivity rating alludes to the amount of sound the speakers can produce from the amount of power that's applied to them. In simple terms, the more sensitive your speakers are, the less power they will require to produce great sound. When considering sensitivity, check your boat's audio system. If it has a decent head unit, you want to look into speakers that have high sensitivity ratings (100 db or higher), as these will be a great match. A lower sensitivity rating works when your boards audio system receives its power from an external amplifier. That said, we always recommend going for speakers with higher sensitivity ratings. Marine speakers need to be able to resist severe outdoor conditions, as well handle life on the water. Marine speakers will be exposed to water, salt, humidity, moisture and UV rays while still producing excellent sound. For example, stainless steel mounting hardware and input terminals will ensure a longer life for your setup. And waterproof speakers will be able to handle a wee bit more than 'just' water resistant varieties. Your speaker's sound quality will be determined by several factors, which include their sensitivity rating, power-handling, build quality, enclosure type, etc. You want to make sure that they sound loud enough and can cut through the background noise of the engine, wind and water. When you take into consideration these factors, you are all set to purchase a high quality set of marine speakers that will give you a great sound quality. This isn't a must-have feature, but it's something that you may want to consider. If you're going to use your boat for parties or hanging out with friends in the evenings, LED lighting is a good way of adding a little bit of ambiance to your boat. The LEDs can be a little cheesy (changing colors, flashing, etc. ), but they're good fun. They're installed under the tweeter and the light reflects off the woofer. So, you've got your eyes on a nice set of marine speakers? Maybe you're wakeboarding, waterskiing or simply want a good audio experience when you're out and about. Whatever your reason, we've noticed there are common questions regarding boat speakers. The majority of boat speakers have built-in marine amplifiers, which means that it isn't absolutely necessary to buy an external one. You can actually achieve pretty impressive sound quality with just the built-in amps. However, an amplifier can certainly help you to take the sound to the next level if this is what you want to do. Firstly, try them out without an external amp before splashing out on one because the truth is, you might simply decide you don't need an external amplifier. Another reason for getting an amp is to power a subwoofer if you choose to use one. Subwoofers without an amp can often be fairly pointless. Additionally, an amp is useful if you're trying to power more than four or so speakers. File Types: Don't limit yourself to MP3s, but ensure you get FLAC, AAC, WMA, and WAV. And hey, what about CDs? Compatibility: We love listening to the radio while out on the water, so we recommend opting for a unit that is compatible with SiriusXM (or your marine radio of choice!). Built-in Bluetooth: When you're out on the water, you want a practical unit that you can control remotely. Built-in bluetooth is an absolute 'must-have' in our opinion. Durability: Your average receiver just won't do. You need a sturdy set that will handle all the water and salt imaginable. This question sort of ties in with the one above. Most stereo head units you come across will four channels for speakers. You shouldn't really use more than one speaker for each channel otherwise you risk damaging both the speakers and the unit. The reverse is true; you shouldn't connect two channels to one speaker. Therefore, if you're only using two speakers, then you should only be using two channels. Take note, though, you're not using the stereo unit's full power, so you'd be as well using more speakers to make the most of it! The difference between marine and wake tower speakers is pretty simple, really - wake tower speakers have been specifically designed to work with a wakeboard tower on your boat. Moreover, the sound that is produced from this kind of speaker is most often so that the rider can enjoy it, rather than the passengers who are right next to the speakers. Wake tower speakers come in all sorts of shapes and sizes but all come with the ability to hang from a wakeboard tower. Since tower speakers sit higher, there is greater sound dispersion (because it is essentially blasting music straight to air). This means that they will usually require more power than marine speakers. Marine speakers, on the other hand, tend to be much more subtle and are usually fitted within the construct of your boat as a flush mount. The other option is to go for box mount speakers, which take up more floor space but means you don’t need to cut into the sides of your boat. In contrast to wake tower speakers, marine speakers are designed for the passengers of the boat rather than aiming to send the music to someone behind the wake. In turn, this means that you need to position the speakers with more care. First of all, it's important to note that these two classifications are different. With waterproof speakers you can fully submerge the product in water without damage, whereas water resistant versions won't survive a dip in the ocean. We don't think it's always necessary. However, you should always ensure your chosen speakers are labeled as at least being 'water resistant' or 'splash proof'. This is usually enough for a challenging marine environment. Bear in mind that a clear IP rating - which signifies the level of resistance - should be present, as vague sales-speak won't give you a clear indication of how much your speakers can handle. For example, at an IP rating of Level 1 the speaker will be fine with rain falling, however splashing will pose a serious problem. Level 4 units, on the other hand, will survive water coming in from all angles. Having said that, the units that we have reviewed are all from reliable brands (such as Polk) and as such will all have a decent IP rating. This is mostly an issue when you try and shop around for an ultra-cheap marine loudspeaker (that is probably not worth buying!). Yet another tongue-twister that manufacturers insert into their sales copy, but what on earth does it mean? When forming the speaker cone, you can either inject the polypropylene (a rigid and weather-resistant material popular with speakers) or cast it. The former is preferable, as it means the cone will retain more stiffness. It will therefore be less affected by resonation, resulting in improved audio quality. In short, if you see IMPP (injection-molded polypropylene) listed on a marine stereo spec, it's a good thing. Your purchasing decision will largely be influenced by the look you want to achieve and the space you have available for your audio system. Flush mount speakers fit very nicely into your boat, look good, and aren't intrusive. However, you need to make sure that you have enough depth (hint: check the top-mount depth in the specifications) for the speaker and some room for air to move freely behind the speaker. You also need to cut holes in your boat in order to install them. Box speakers mean that you don't need to make holes and are already boxed so, therefore, they produce a nice sound. However, they take up more space which can be a pain, especially on smaller boats. For those of you who don't know, a subwoofer takes the bass to the next level and gives your audio setup that 'oomph' you're looking for. Choosing whether or not to get a subwoofer for your marine speakers is entirely a personal choice based on how you enjoy hearing your music. Most high-quality boat speakers have adequate bass already but some really want to crank it up a notch and feel the low frequencies. If you decide you want one, make sure to power it properly because if it doesn't have enough power feeding to it, it will be rendered near enough useless. This will typically be done through an external amp if the subwoofer doesn't have an inbuilt one. Additionally, aim to install the subwoofer as low down as you can for the best effect. Who would have thought that buying a set of speakers for your boat could be so confusing? There are so many variables and, as a result, questions that come along with it. ​One of the most common ones is about the installation and placement process. How do you go about achieving that perfect audio configuration? Not only do speaker specifications play a role in the quality of sound you'll hear but so does the placement of the speakers on your boat. The best sound you will hear from your speakers is directly in front of them, which means it is important that you position your speakers wisely for you and passengers to hear. In addition to the quality, placement can predicated on the amount of available space, aesthetics, and where they are least likely to get damaged from water and being hit. We've actually produced a more in-depth guide on marine speaker installation and placement, so head over there if you want to learn more about how it will affect your audio experience. This is a question that crops up again and again from those of you looking to purchase outdoor speakers. Simply speaking, frequency response is the audible frequency range that your speaker can produce. Our hearing can generally hear anything from 20 Hz onwards (low bass) to 20 kHz - of course, this varies from individual to individual. What you're looking for is consistent volume/amplitude throughout the different ranges, not just the capability to produce sound at a particular Hz range. Therefore, you should always check the range alongside a qualified dB specification. Hint: you're looking for a small number here (i.e. +/- 3 dB is better than +/- 40dB). There are several other factors that come into play that makes the manufacturer's listed frequency response almost irrelevant. Depending on the overall quality of the build, for example, sound quality can vary greatly. Our advice? Be careful if the specs sound too good to be true - that usually means the speakers are cutting corners elsewhere to 'bloat' the specs they can advertise, resulting in overall lower quality sound. Another consideration to take into account is what kind of sound you’re expecting to hear from it. If you’re planning on cranking up the volume and really feeling the effects of the loud drum and guitar solos, then you’ll want a speaker which has a high peak power rating. This will ensure that they can handle a high dynamic range well without distortion or blowing. The ‘nominal’ rating, or RMS as it is also known, is the average power you’ll get from the speakers. How does this affect you? You should aim to pick a speaker that will sound loud enough below its RMS rating. When putting together our marine speakers review series, we selected 7 of the best from a range of high cost and high quality, to good quality and value for money. After all, everyone is looking for very different things when choosing their favourite speakers. Picking speakers is a very personal preference and it can even boil down to how they look. With our marine speaker reviews, we aim to make the shopping experience easier. We’ve detailed the important facts about the speakers and left out the sales pitch. It can be hard to sift through the information online and depending upon where you read a review, it can be biased at times. We’ll always deliver you an unbiased opinion and an honest view on which marines speakers we think come out on top.